Available in seven language editions, SpeakEasy puts the essential words and phrases you need to know right in your pocket. Featuring easy-to-read phonetics, crystal-clear audio and our innovative “slow play” feature, SpeakEasy phrasebooks are designed to do exactly what the name says — make speaking a new language easy for you. Written specifically for English speakers, SpeakEasy leaves no room for mispronunciation. Each phrase includes a translation to one of seven foreign languages, an easy-to-read phonetic translation, and an audio recording of a native speaker — all contained in a well structured, user-friendly interface. 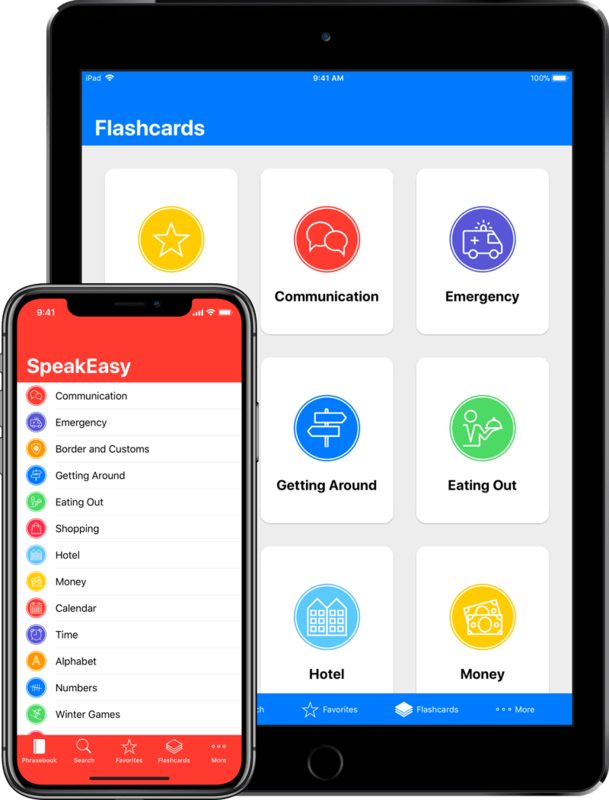 SpeakEasy helps you to memorize those essential words and phrases by providing a complete set of flashcards. Each category of phrases in SpeakEasy is also provided as a deck of flashcards. This lets you quickly practice related sets of words and phrases. Simply choose a category, and tap each flashcard to reveal the answer. Flashcards show English on the front, and the foreign translation and phonetic pronunciation on the back. This challenges you to recall the foreign translation from memory. If you’d prefer the reverse challenge — i.e. to be shown the foreign translation first and to recall the English — you can do that too. Got a few specific phrases you want to practice? Simply add those phrases to your Favorites, and then practice then using the Favorites flashcards deck. Looking for something specific? Find it instantly with the Search feature. Add your most-used phrases to your Favorites list for even faster access. When you need to find a phrase in a hurry, SpeakEasy’s Search function is there for you. The second you start typing, it starts searching. Search searches everything — English, the foreign translation, and the phonetic pronunciation. Overheard a foreign word you didn’t understand? Search for it and find the English equivalent. Find yourself referencing the same phrases over and over? Add them to your Favorites list with a swipe, and you’ll always have them at reach. Then practice those phrases with the Favorites flashcards deck, and — hopefully — you’ll commit them to memory. Whether you just need a quick travel reference, or are learning a foreign language, SpeakEasy has the phrases you need. Every SpeakEasy app includes easy-to-read phonetics, written specifically for English speakers. Can't read the Cyrillic alphabet? Not sure how to pronounce the "ll" in Spanish? SpeakEasy's phonetics have you covered. Learning a language is tricky at the best of times. If a particular phrase is too fast for you, SpeakEasy apps can play the audio slower. Audio by Native Speakers. Not Robots. Unlike some translator apps, all of our audio is recorded by native speakers of the language. So you can learn to speak the language like a real human - not a robot. Whether you're on a boat, in the air, or in an underground tunnel, SpeakEasy will continue to work. 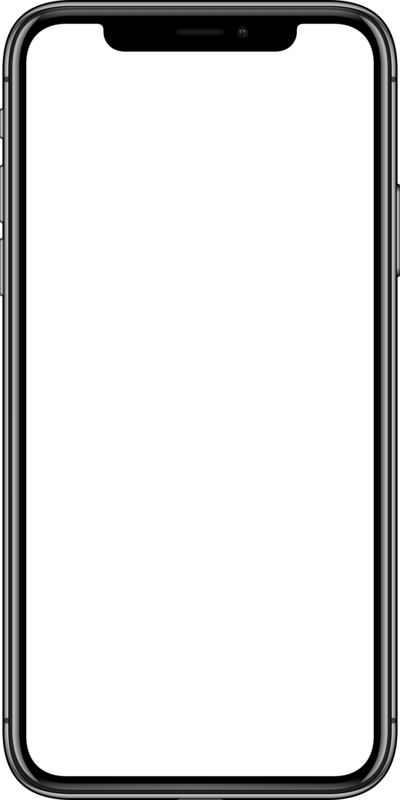 SpeakEasy is optimized for both iPhone and iPad and supports all the latest technologies, including split-screen multitasking on iPad. Personalize your phrasebook by adding your most frequently referenced phrases to your very own “Favorites” list. Your "Favorites" list also becomes its own set of Flashcards, so you can practice those phrases until you've got them memorized. You're in control, so sort your personalized "Favorites" any way you like. In a hurry? Find the exact phrase you're looking for with our instant phrase search. Your search results are returned immediately as you type. Need to know what a foreign language word is in English? Overheard a word you didn't understand? SpeakEasy lets you search by English, the foreign language, and the phonetics. SpeakEasy has been receiving rave reviews from around the world since 2008. Here are a few of our favorites. Another cool feature it has is the slow playback feature—if you hear a phrase and it’s too fast, you can play it back at a slower speed to listen to it more carefully … it’s a great way to review learned phrases and words. All in all, this is a great easy to use phrasebook of the most common and essential Russian words and phrases. It’s especially great for those who are planning on traveling to a Russian-speaking country. Since the content is already in the app and there is no searching required, you don’t need an internet connection for it to work … It's a helpful little app and I really liked the ease of use of things being broken into categories. We adopted two Russian-speaking kids and I’ve been to Ukraine several times. This is the most comprehensive, easy-to-understand source for learning useful words and phrases I’ve found. It includes flash cards for practicing and an option to slow down the pronunciation of the words so users can get it just right. Highly recommend. Downloaded this two years ago and still use it frequently. Great app with the most useful phrases and with good pronunciation too. So easy to use. It is nice that there is the option for them to say it slower. The flashcards are great and handy as a quick lesson. Of all the language software packages/apps that I've used while pursuing language learning, this product remains a tremendously accessible vocabulary cornerstone that I continue to turn to from time to time. I can't rate it highly enough. This app is very useful for taking first steps to learning Russian at your own pace. Having a native speaker to pronounce words and letters is a must and really helps. A good choice. This app is amazing, really. First, to learn Russian, I started using a translator. It sucked. I could barely understand what it was saying. It was saying the words too fast, and I just couldn't understand what in the world it was saying. So I bought this app. And it spoke slower and more understandable. This app is just great. I played around with a few free learn French apps and this one was my favorite, so I bought the full version. Definitely a good investment to have more phrases to use while traveling. I like how for each phrase the app has the written words, how an English speaker should attempt to pronounce the phrase, the spoken audio, and the option to play it slower if need be. As a non-French speaker trying to learn important phrases before a trip to Paris this was perfect.